(Nanowerk Spotlight) Engineered nanoparticles are rapidly becoming a part of our daily life in the form of cosmetics, food packaging, drug delivery systems, therapeutics, biosensors, etc. A number of commercial products such as wound dressing, detergents or antimicrobial coatings are already in the market. Although little is known about their bio distribution and bio activity, especially silver nanoparticles are extensively used for all kinds of antimicrobial applications. Ultimately, these nanoparticles end up in the environment during waste disposal. Largely due to a scarcity of data on the toxicity, intracellular distribution and fate of silver ions and nanoparticles inside an organism, regulatory bodies so far have not felt the need to regulate the use of such materials in commercial products or disposal of such products. In a major reversal, although more of a symbolic gesture, earlier last year the U.S. EPA has determined that clothes washing machines that use silver ions as a disinfectant will have to be registered as a pesticide (The first federal restrictions on nanotechnology could be coming soon). The lack of regulation has even led to a dramatic demand from activist groups to completely ban the sale of nanosilver products (Groups file legal action for EPA to stop sale of 200+ nanosilver products). In order to improve the scientific data and to enhance our insight on the health and environmental impact of silver nanoparticles, scientists in Singapore have initiated an in vivo toxicology study to examine nanosilver in a zebrafish model. They conclude that silver nanoparticles have the potential to cause health and ecotoxicity issues in a concentration-dependent manner. "Owing to the wide range of applications of nanoparticles in commercial products, it is certain that such particles will end up in environment through uncontrolled waste disposal" Dr. Suresh Valiyaveettil tells Nanowerk. "Therefore, it is important to learn and assess the impact of such nanoparticles on the environment as soon as possible. Our work highlights the potential hazards of silver nanoparticles in aquatic animals such as zebrafish. We used zebrafish as a model system due to its fast developmental biology and transparent body structure. The zebrafish embryos exposed to silver nanoparticles showed deposition of particles in vital organs such as the brain and exhibited severe developmental defects." Valiyaveettil, an Associate Professor in the Department of Chemistry at the National University of Singapore (NUS), together with collaborators from NUS, published his findings in the May 14, 2008 online edition of Nanotechnology ("Toxicity of silver nanoparticles in zebrafish models"). In this paper, the scientists described their findings that nanosilver-treated embryos exhibited phenotypic defects, altered physiological functions, namely bradycardia, axial curvatures and degeneration of body parts. "The focus of our work is to understand the role of nanoparticles in living systems, in particular, how do nanoparticles interact with biomolecules such as proteins and DNAs inside a cell and what are the consequence of such interactions" explains Valiyaveettil. "We hope to understand the consequences of exposure of nanoparticles to living organism and develop proper waste disposal methods (industrial, research lab, commercial products etc. ), so that the balance of the ecosystem is not challenged by nanotechnology." 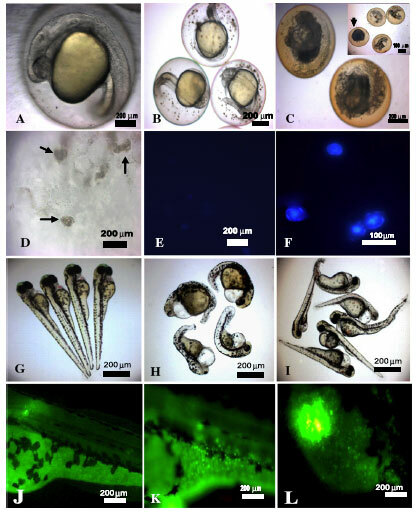 In their study, the NUS researchers chose zebrafish embryos as model systems for testing ecotoxicity of the silver nanoparticles. As we have reported before, zebrafish embryos offer a unique opportunity to investigate the effects of nanoparticles upon intact cellular systems that communicate with each other to orchestrate the events of early embryonic development (First of a kind real-time study of nanosilver in fish embryos raises hopes and concerns). Valiyaveettil and his team used different concentrations of Ag+ ions, silver nanoparticles capped with BSA (Ag-BSA) and starch (Ag-starch) to monitor the developmental abnormalities induced by the nanoparticles. "The capping agent (stabilizing agent) was chosen to make the nanoparticle soluble in water and to protect nanoparticles from agglomerating in the medium" Valiyaveettil describes the experimental set-up. "The choice of starch and BSA was made in order to synthesize a water soluble and stable nanoparticle suspension. Moreover, use of organic solvents and other toxic chemicals may yield highly toxic products that hinder bio-applications. The nanoparticles employed in our study were highly stable and water soluble." The extent of toxicity was measured in terms of mortality, hatching, heart rate and abnormal phenotypes. Transmission electron microscopy (TEM) of the Ag-BSA treated embryos showed a significant concentration of nanoparticles inside the nucleus. Of particular concern could be the fact that TEM images showed the presence of nanoparticles in the brain of the embryos. "Nanoparticle deposition in the central nervous system could have deleterious effects, by negatively controlling the cardiac rhythm, respiration and body movements" says Valiyaveettil. "The pathological events following long-term deposition of nanoparticles in the nervous system and other organs remain unclear." The scientists hypothesize that the deposition of nanoparticles inside the nucleus of the cells led to the observed toxicity through various mechanisms such as DNA damage and chromosomal aberrations. Furthermore, the exposure of silver nanoparticles resulted in accumulation of blood in different parts of the body, thereby causing edema and necrosis. Valiyaveettil expects that his team's data, along with other literature, can be used as guidelines for creating safety regulations on disposal of nanoparticles. "The critical lethal concentrations can be identified and precautions can be taken to eliminate such concentrations in future applications, especially in the biomedical field. Also, understanding the nanoparticle-biomolecule interactions can be used for developing potential drug candidates as well as drug delivery systems for various diseases, using low concentrations of these nanoparticles." The NUS team is planning to direct further studies towards the genotoxicity and the gene expression profile of silver nanoparticles treated embryos. They also suggest that long-term exposure studies employing low concentrations should be carried out to see the effects of silver and other metallic nanoparticles in animals over time. The team is currently unraveling various pathways that operate in silver nanoparticle toxicity and exploring cyto- and genotoxicity of these nanoparticles. This hopefully will lead to a clear picture of the positive and negative aspects of silver nanoparticle exposure. "Our study pointed out the adverse effects of silver nanoparticles in aquatic species. All applications involving silver nanoparticles should be given special attention and promoted only after detailed studies" says Valiyaveettil. "The release of untreated nanoparticle waste to the environment should be restricted for the well-being of human and aquatic species."